City centre visitors looking for a bargain at one of Chester’s restaurants or eating establishments in the New Year could be in for a tasty treat. 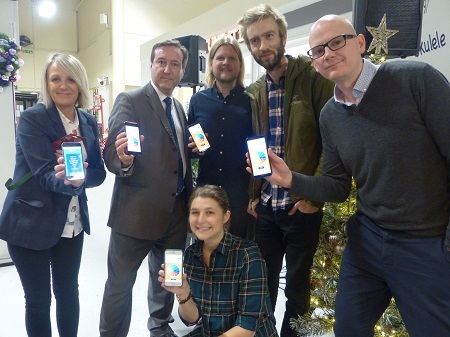 The Council and its partners have been supporting the Good for Nothing community in Chester to encourage residents to visit Chester’s independent eateries and restaurants. The collaboration has resulted in a new online game called the Chester Hunger Games. In the game, residents open a mobile web page which invites them to spin the wheel to select at random a different restaurant and unique offer. They can then visit that specific venue and claim back the offer. A trial of the game took place at the revitalised Chester Market last week. The one-off event showcased a test version of the game with food traders at the market. The Council, in collaboration with Marketing Cheshire, CH1Bid and MP’s Office, plan to roll this out to include the whole city centre in the New Year. Councillor Brian Clarke, Cabinet Member for Economic Development and Infrastructure, said: “Chester Hunger Games will run for the month of February 2019 across the city and will help to promote the fantastic independent traders in Chester. There are a diverse range of different businesses in Chester offering fantastic food and good service and this game will introduce people to them. Work is ongoing to sign up more eating establishments in Chester who wish to take part in Chester Hunger Games. If you would like your business to take part, email business@cheshirewestandchester.gov.uk or telephone Cheshire West and Chester Council’s Business Growth Team on 01244 973618. The idea for the game grew at a recent Good For Nothing meeting when Chester-based branding agency Stride proposed using simple online games to encourage local people to try restaurants they either have never been to or might not have even heard of. GFN Good For Nothing Chester is a 300-strong team of talented, creative professionals from Chester and west Cheshire who meet every couple of months to do something good for nothing by pooling their professional skills to solve issues and business problems and accelerate positive change for the communities in Chester. For information visit http://www.goodfornothing.com/chapter/chester or on Twitter @GFN Chester.